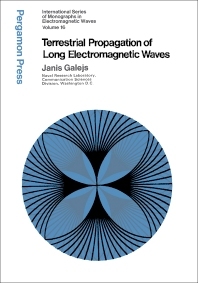 Terrestrial Propagation of Long Electromagnetic Waves deals with the propagation of long electromagnetic waves confined principally to the shell between the earth and the ionosphere, known as the terrestrial waveguide. The discussion is limited to steady-state solutions in a waveguide that is uniform in the direction of propagation. Wave propagation is characterized almost exclusively by mode theory. The mathematics are developed only for sources at the ground surface or within the waveguide, including artificial sources as well as lightning discharges. This volume is comprised of nine chapters and begins with an introduction to the fundamental concepts of wave propagation in a planar and curved isotropic waveguide. A number of examples are presented to illustrate the effects of an anisotropic ionosphere. The basic equations are summarized and plane-wave reflection from a dielectric interface is considered, along with the superposition of two obliquely incident plane waves. The properties of waveguide boundaries are implicitly represented by Fresnel reflection coefficients. Subsequent chapters focus on boundaries of the terrestrial guide; lightning discharges as a natural source of extremely-low-frequency and very-low-frequency radiation; and the mode theory for waves in an isotropic spherical shell. This book will be a useful resource for students and practitioners of physics.